The best way to withdraw from methadone is using tapering protocol under medical supervision. More on what to expect as you withdraw from methadone here. Methadone is a prescription drug that can be used as a pain reliever and to treat opiate addictions. Like many other opiate substitution drugs, though, methadone can be habit forming. So how can you prepare to withdraw from methadone (whether you’re physically dependent or need help with methadone addiction)? We review here, and invite your questions about methadone withdrawal protocols at the end. When do you withdraw from methadone? It can be hard to decide when to withdraw from methadone, especially since this drug is often prescribed legally. If this is the case, withdrawing from methadone should be done either when a person does not need the drug any longer or when a doctor suggests it. If a person is taking the drug illegally or abusing it, they should withdraw from methadone as soon as possible. Continued use of this drug can cause a number of different medical problems, including heart and respiratory problems. How long to withdraw from methadone? Methadone stays in your system for at least a few days after last use. Symptoms of methadone withdrawal usually manifest when a methadone dose is cut in half or completely stopped. Symptoms will often be most intense during the first few days of the withdrawal process and can last quite a while. Individuals may experience these symptoms anywhere from a couple of weeks to a month, or two (depending on individual dosing factors). Withdrawal symptoms can usually be eased at home with no complications. Some over-the-counter medications, for instance, may be used to relieve some symptoms of detox such as runny noses and nausea. Additionally, individuals withdrawing from methadone should drink plenty of water, which can help ease the detoxification process. Staying busy and talking with a trusted friend, family member, or counselor can also help some individuals deal with drug cravings. Can I withdraw from methadone at home? 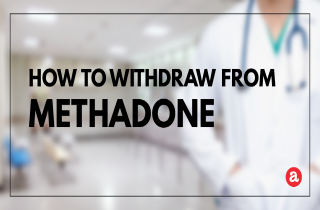 It is possible to withdraw from methadone at home, but it isn’t recommended. Instead, most medical professionals recommend that individuals trying to withdraw from methadone do so under the supervision of a doctor. Physicians and addiction specialists can help methadone addicts understand physical and psychological dependence, prevent a relapse, and ease withdrawal symptoms. Most experts agree that the best way to withdraw from methadone is to do so under the supervision of a qualified medical professional. Your doctor can help you withdraw from methadone, as can mental health professionals. However, medical supervision is not an absolute necessity when withdrawing from methadone. All that’s necessary is persistence, a great support system, and a true desire to quit using this drug. Are you trying to withdraw from methadone? Are you scared, nervous, or confused? Leave your questions or concerns in the comment section below, and we’ll get back to you as soon as we can. On the other hand, don’t hesitate to leave a comment with advice and experiences of your own. Hi Kay. I suggest that you consult with your doctor to help you plan a tapering schedule to quit methadone. If this don’t work, call the helpline you see on our website to find out what are your possible treatment options. Hi Janine. If you experience severe withdrawals, consult with your doctor to lower your tapering schedule. To Terra, If you have a warrent for your arrest, I’m sure you already know that when you go into a drug detox center the police somehow get notified that you are there at least with the state run detox rehab centers and they will come there and arrest you I’ve seen it happen three different times. The taper you suggest sounds so fast! The truth is that the clinic doesn’t encourage your leaving! They believe that addiction is a disease just like diabetes. Taking methadone everyday for the rest of your life is acceptable. It is only drug replacement therapy. The ones in my area only take cash or Medicaid. It is a BUSINESS for profit! Withdrawal can take months! I went down sooo slowly after like 10 yrs and still feel like total crap! A lot of people who go to a clinic still use illegal drugs too! Dirty piss tests don’t matter. Only if you can’t pay will you get kicked out. At 5 mg detox a day! Horrible situation. Me off methadone to Percocet I assume .whst am I in for here as far as sickness etc. I have been detoxing off of methadone for months, with a slow wean. I am now 19 days clean. I was taking 20mg at HS for 10 years for pain. my worst symptoms have been insomnia, RLS, diarrhea, and feeling cold, antsy feeling. The meds I am using to assist me have been the following: xanax, percocet. ( I was already on percocet as well as methadone, so this wasnt new) clonidine did nothing for me, but the med that works the best for me is Tizanidine. It is a muscle relaxer. It helped with sleep and the RLS. It really has been my life saver. I have not seen any one else mention this, so I am letting everyone know, maybe it will help others. I take 6-8mg at bedtime. My doctor had no problem RXing it for me. Like I said, I am at day 19, feeling about 75 percent better, but it has been hell. So Ive been off methadone for 2 weeks and for the first 5 days after my last dose I felt amazing. On the sixth day I woke up and my body (bones,joints,musscles) was so weak and hurt so bad I didn’t want to get out of bed, but I couldn’t keep myself down, my legs and arms wouldn’t stop moving and shaking and the worst was my stomach in 7 days I lost 14 pounds I couldn’t eat, sleep, or work and when I got to the sixth day of my withdrawal I knew I had to do something so I called urgent care and got suboxone, because I been on methadone so long when the sub hit my system I felt normal and not just my body my mind was back to normal. I didn’t realize how fucked up the methadone was, I was depressed and extremely unmotivated but as soon as the next day I was up and started getting my life back. METHADONE IS POISIN and kept me in an addicts state of mind! Hello my name is Terra and I have been seeking methadone detox for quite some time now …. a little about me is im 24 years old and a single mother and that i was a herion addict for 6 years then I got preganant in 2014 and was told i had no choice but to be on methadone (many drs told me this) idk if it is true or not but the fact of the matter is I got on methadone in March of 204 and i am thankful that is was the only thing to keep me off herion in fact i have no desire what so ever to even see herion. But I did end up having my daughter 2 months early she did have to come off methadone in NICU and did so with in 3 days and it was the most hurtful thing to watch. I was on 155 MG per day and I go to the clinic daily. They dont let me detox the way i want to so it has been now 4 years since I have been on methadone daily. I did one time skip 4 days just so i could go down on my dose. I went from 155 to 82 and was on 82 for a year and then the other day i did it again and im on 65 MG so i do have to go to jail soon over some community service and where i live they do not care if u are on methadone at all they do not even give tylenol lol but I am SCARED to death to go to jail and detox from methadone and I am a mom so a single mom at that and my family is not helping me with my daughter so it is just me so i want to detox the most comfortable way possible (im sure we all do) but i have a hard time caring for my kiddo when withdrawling. PLEASEEEEE let me know if you have any idea how to help me get off methadone! I hate it i really do please! Also, call the helpline you see on the website to get in touch with a trusted treatment consultant who can help you find the best rehab program for you. I have been using methadone for about 8 months and want to stop using so my professionals reduced it from 50 ml to 45 today for a month will i be fine and still feel the same? My husband recently got out of rehab for being on many different pills. He has struggled with methadone for a few years now and has tried to get off of it before. I’m not sure that the rehab was the best idea because they just cut him off almost cold turkey. I don’t know what to do to help him through the withdrawal process now or if he is going to be ok to continue to go through this process cold turkey. I have been taking 40mg split dosage of liquid methadone for four months now. Will it be easy for me to get off of this mess? I’ve been taking prescribed methadone for 15 years! For restless leg syndrome that was so severe I’d try anything! Well now I’m stopping to take Naltrexone instead. Thrbfirst day of Naltrexone is today so I’m scared about meth withdrawal I did taper off should i go somewhere or just hang at home for few days ? I was on 55ml. I stopped cold turkey it’s been 4 days closer to 5. Can’t sleep and little energy. It’s the intense feeling in your stomach that is unbearable. I find hot shower subsides it. It’s not a walk in the park but very doable people. Hi Ashley. Experts claim that slowly reducing the daily dose of the drug in a safer way to quit the drug. I suggest that you consult with your doctor to help you create an individualized tapering schedule. With all due respect to you and your principles (I commend them! ), methadone withdrawals will not start for at least 24 to 72 hours after your last dose. I am speaking from a long experience & years of research. As you noted, it stays in your system for a few days. I have detoxed from methadone cold turkey many times & have also detoxed from methadone under the care of the doctor. Every time I did this, the withdrawals do not start until the 2nd, 3rd, sometimes not until the 4th day. Thank you for what you do. Hi Cassandra. Thank you for your input. The onset of methadone withdrawal depends from the individual himself/herself. Our information is taken from governmental sources which are generalized. Hi Ann. Speak with someone who’s superior there. There must be someone who’s in charge of this kind of issues. After many years of being on methadone, my husband is trying to get off of methadone right away, on his own. Two days ago he took a total of 60 mg. He took 20 yesterday morning, the 20 last night at 9:30. Today he waited till almost 1:30 pm to take 10 mg.
Is this safe? He is using Gabapentin to ease the pain a little. (He was taking both already, before he cut the methadone.) I feel helpless, seeing him lying in bed, suffering. Also, your husband should consult with his doctor to help him create an individualized tapering schedule. I went to a methadone clinic to get off a prescribed morphine dose of 600 mg qd following recovery from surgery. I reached this dose over 2 years of pain. I could not seem to reduce the morphine because of the multiple daily doses . Methadone was single does. I titrated to 159 mg of methadone and began the detox the next day. Over several months there were no symptoms at all. When I reached 18 mg symptoms began . I was reducing at a rate of 3mg every 5 days . Mostly I was sick all the time with s day or two break . at 6mg qd I decided I could not stand the up and down . The dr told me at 12 mg I could just stop if I was willing to endure the discomfort. I wasn’t and I continued to 6 mg. Two days after that reduction I went to stsy with my adult child and his wife. Both are RN’s. One has some significant experience with methadone patients garnered from rotations but little experience with the withdrawal. I am a retired RN. I abruptly stopped the Methadone 2 days after getting to 6mg. My RN daughter in law said her hospital methadone program generally stops dosing at 8mg . I take Clonidine .2 mg and Balcofen 10 mg often every 6-8 hrs. Two days after complete cessation of Methadone my symptoms have become very high moderate . I have never experienced even the slightest craving for either methadone . I did when I tried to detox from morphine without suoervision. I don’t care to go to my childrn’s hospital Methadone clinic for more of the same I simply want out of this addiction . My worse symptom being the coughing producing a clear viscous discharge. I worry that I will become short of breath . Please advise of best way to reduce all symptoms . Do you recommend flu medicine . Hi Keri. Have you tried to replace your counselor? Also, you may enroll into a support group or consider therapy sessions that will give you the support you need. Ok I’m forced to stop 80mg/day of methadone liquid from client to zero in 7 days due to insurance reasons. I have few 8mg auboxone steips to help with WD of methadone and I’m sick of everything now. Is it better to wait till 7th day and get full 80mg or reduce by 10mg/day until 7th day and than wait until SICK before inducing sub?? Do you know anything about using IV Ketamine to rapidly withdraw from Methadone. My pain specialist doctor – head of anaesthetics for a major hospital in a very large city in Australia wants to admit me to hospital and bring on rapid detox under IV Ketamine. Withdrawal will apparently be over very quickly. Ketamine masks withdrawal symptoms & treats pain during the process. I can’t find much information on this…. any advice, references, information greatly appreciated. If I go ahead I will let you know I get on. I am a long term patient of a neurologist, who had me on methadone, Oxycodone as well as Gabapentin. I have severe sciatica in both legs, causing me occasional complete numbness in left leg from the knee down. This has started happening since I started withdrawing from methadone, against my will because my current doctor just retired a month ago and I cannot afford a lot a month for a new doctor, on disability. I want to know if when withdrawing from methadone, if there is anything that can help with the severe physical pain whether it be over the counter or prescription, I already take ibuprofen 800mg 3 times a day, flexiril 3 times a day, and Gabapentin 600 mg 4 times a day. Yet despite all that I am still in agony, can’t sleep, bend or barely walk. I use a cane, back brace, and I put ice on my pains almost 24/7. What can I do? I have no money and only Medicaid for insurance. There are no neurologists, or pain management doctors within a five hundred mile radius that accept my insurance, a methadone clinic would cost more than a doctor. Can a regular primary care doctor help me with anything, does anyone think? Even meds just to help ease withdrawal? Are there any home remededies or supplements that can help with easing withdrawal symptoms? Like I heard turmeric helps with pain. Has anyone tried it? Does anything out their help with the freezing cold / burning hot sweats and flashes? Anything that could help with the severely increased neuropathy pains I feel a million times worse without my methadone? Despite the fact I take gabapentin, which I have noticed does help with the hot/cold sweats more when I take it. That horrifying ridiculous excuse for a pain doctor I last saw gave me clonidine. That stuff doesn’t help at all, and is in fact a blood pressure medicine, with a side, off label use to supposedly help some withdrawal symptoms. I see absolutely no benefit. I also wanted to know if Suboxen or Subutex has any benefit for helping with physical pain, like methadone does. I know a lot of people benefit from it to help stay off of opiates, but does it effect pain at all? If anyone would have any suggestions that would help, I would greatly appreciate it. I am very close to just going ER. The only reason I haven’t is because I don’t want to be trapped at the ER for ten hours with no hope of being able to smoke a cigarette. I’m scared they would admit me, (same smoking complaint, smoke-free campus as they call it. Any help, information, or ideas that I could use would be greatly appreciated. I am at the point, that I think cutting my own leg off would be preferable living in this screaming agony. (That just made me feel like Dr. House, M.D., ha, ha but even he got off the Vicodin). Not to mention my back currently feels like I am a cockroach that was stepped on, but survived.and forced to live in horrible pain. (Only I was hit by a drunk driver in a minivan). Thank you for any suggestions and have a great day. Doc put me on this at pain management and now I’m terrified. Been on this a week after being on opiates for several years with no problems! HELP!!! IM SCARED!! Hi I have been on methadone for 20 yrs. dare I say it. I have felt like I’m in shackles it’s terrible. I’ve been stuck on 15mgs to 12.5mgs for 11 yrs due to having children. Am currently on day 8. Day 5 I felt crap an strength or energy an aching but not as bad as thought would. I seemed outpatient help but haven’t gone yet. I know everyone’s different but roughly how long? When do you feel your worst? I have been prescribed Methadone for pain management for a prolapsed and torn disc in my lower back..I have now been on Methadone for 1 year and my dosage has been at the quantity of 50mgs a day..I am now on a reduction programme which is supervised by my doctor..As I reduce the amount of Methadone my Back Pain increases…I have told my doctor that I want to be clear of Methadone for a few reasons ie. I suffer severe Constipation from it and the Main reason is that Here in New Zealand I am unable to get employment as Employers have a Zero Tolerance to Drugs even if they are a Prescribed medication as in my case.. Over the last few days I have tried to go Cold Turkey but it has been too hard on me..My doctor is decreasing my intake by 1 mg a week. My question is …Do you think I can decrease quicker than 1 mg a week as I am getting frustrated with how slow this Decline in Methadone consumption is going? Hello Pieter. It is possible to be decreasing larger doses, but I’d follow the doctor’s guidelines. You see, dropping larger faster can cause hash withdrawal symptoms. It may seem very slow, but it’s the safest way too. I hope that soon you will be completely off methadone and will find work without any problem. Hi Glenn. Thank you for your valuable information and for sharing your own experience as advise for others. I agree that the slower and more gradual the taper – the less risk of withdrawal discomfort. And, yes, having medical advise and support is needed, but also the will and motivation to make it through. Hello Lous. How is your son doing? Such fast tapering is expected to set off a series of withdrawal symptoms. He may need some time off work, as I hardly believe he will be able to continue working normal days when withdrawal starts. I recommend you take him to the doctor to get advise on how to treat symptoms and manage through this period. I have severe peripheral neuropathy, which I was told was from monoclonal gammapathy, which I went through IVIG infusion with no results. Was on 80mg methadone in three divided doses a day and seventy five mg oxecodone in divided doses also, from a university hospital pain mgt. clinic for several years. I am sixty nine. My doctor retired and because of shortage of staff they referred me to outside doctor who immediately cut both doses in half, saying that only cancer patients needs doses that high.. It has been three weeks now since then and the pain from the perilpheral neuropatlhy has gotten so bad that I can barely walk now and lie down during the day to avoid the pain of being on my feet. Also have pain in my large muscle groups. Pain is continuous pain and night. Will I eventually get relief from the pain at this present dose of 40mg of methadone and 40 oxecondone?. There Is no speaking to this doctor, his way or the highway. I find getting another doctor to be impossible when I mention my situation. Help. Hi Lawrence. I’m very sorry that you’ve been put in such a situation. But, I believe that you will be ok, since cutting back half of your usual dose causes withdrawal symptoms to occur. Strangely, withdrawal symptoms tend to mimic the symptoms of the condition that is being treated. You will get used to the lower dose in time, and as withdrawal effects subside you will be able to move and feel better. See if your pharmacist at the local pharmacy can suggest some medication, lotion or cream that can help relieve the pain. Hello Arcenio. I believe you can make it through, but you will need professional medical help. I suppose you’ve been taking the methadone for quite a while, which makes it unsafe to just quit or stop taking it on your own. Check out this article that explains Treatment Options for Veterans to get a better idea of what your options are. Also, you can call the helpline number displayed on the page.